A skylight is more than just a design for your home or any property. It provides lighting & ventilation for your home. It is strategically placed on the roof so they may prevent unwanted summertime solar heat gain and winter season heat loss. In order to do so, manufacturers of skylights make use advance glazing technologies such as insulated glazing, low-emissivity (low-e) coatings, and heat-absorbing tints, to reduce or mitigate the occurrence of the aforementioned events. Business owners and homeowners like you have been drawn to install and use skylights for your property in order to provide daylighting and additional ventilation when needed. However, apart from addressing such needs, recent developments in skylight design now incorporate the use of open-sided cylinders, sun-tracking, mounted mirrored reflectors, and large lens-like elements to provide daylighting without experiencing daytime heat gain and heat loss during nighttime. Another aspect of skylights that may have caught your attention is ventilation it provides. With an operable skylight installed on your roof, you may now release hot air that is naturally accumulating near your home’s ceiling. It may be opened manually with the use of a chain, pole or even a crank. Thus, releasing the trapped hot air on your ceiling. Aside from the manual opening of the ventilated skylight, roofing contractors nowadays also offer automated units that come with electric motors or pneumatic devices for additional convenience when open the skylight. However, you should not only be limited to a ventilated skylight, for there are other types of skylights for your business or residential properties. 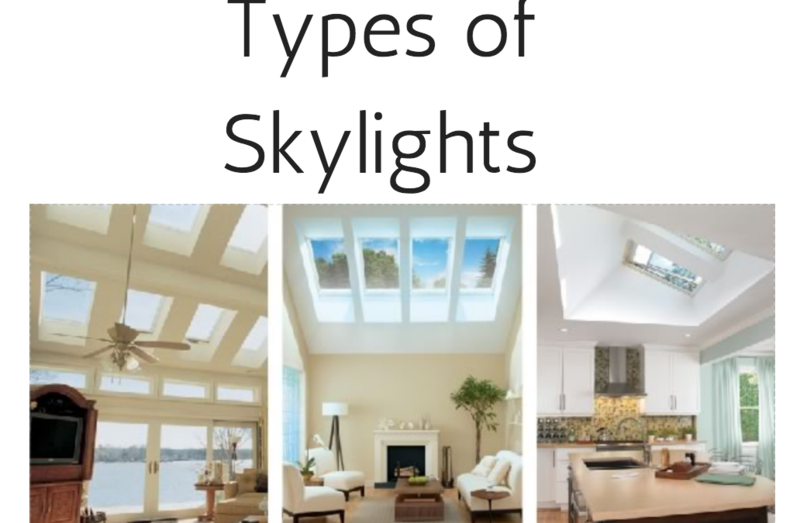 Depending upon the materials, type of use, cost, types of roof and room type, you may try some of the skylights as discussed below. This type of skylight is considered as the most prominent type of skylights being used by homeowners or business owners. As the name would suggest, as fixed skylight does not open for any air ventilation. They are completely sealed or fixed to the roof. A fixed skylight is commonly observed in areas like the stairwell and attics. In terms of its composition, 90 percent of the materials used in this type of skylight is glass. On the other hand, the remaining 10 percent goes to the frame of the fixed skylight that is made up mainly of aluminum, timber, or steel, depending on your liking. A tubular skylight is one of the new types of skylight available in the market. They are mainly used for areas or roof space that are very small. Similar to the ventilated skylight, a tubular skylight also provides light and ventilation, for it may be opened, unlike the fixed skylight. What separates tubular skylight from the previously mentioned skylights is its size, which fits in very small roof space. Tubular skylight consists of a small tube-shaped pipe having a diameter of around 10-15 inches. For protection, it is covered on top with a spherical glass dome that gathers the light while transmitting it through the tube. It is made possible because the tube is built of silver finished mirror type quality. The light from the outside is transmitted inside your home without any loss of light, thanks to its finished mirror type quality. This skylight is also named after its geometrical form. As the name would suggest, a pyramid skylight copies the shape of a pyramid. Depending on the requirement of the use, it can be in different sizes. If you are not familiar with this type of skylight, a pyramid skylight is mainly employed in lobbies, entryways and large spaces of a commercial building. However, it may also be used as a home skylight, configuring its properties as per the requirement. As its name would suggest, this type of skylight is something that is customized for a specific roofing system or home style. You may benefit from this type of skylight mainly because of the aesthetic appeal it provides. A custom skylight will naturally blend with the style and design of your home, as long as you customize it according to your current home style and roofing system. A custom skylight may come in various forms or presentations. They may be in different geometric shapes and sizes as you would like it to be. Apart from the design itself, you should also take note that when customizing a skylight for your property, the materials to be used should likewise provide the needed lighting and ventilation which is the primary purpose of why your property is having a skylight. A barrel vault skylight is not typically used for residential properties, for it is frequently observed among non-residential buildings because it may lessen the privacy aspect of your residence. To give you perspective, in most cases, more than 80 percent of the roof area will be covered by this type of skylight. Hence, exposing your home environment to the public. A barrel vault skylight is usually employed in medical and educational institutions, industrial complexes, passageways, canopies, parking shelters, and mall arcades. Another variation of a skylight is the dome-shaped skylight or the dome acrylic skylight. The main purpose of the dome design is to allow the sunlight to scatter through any of your rooms at home, instead of directly penetrating in a room. This type of skylight is built upon strong and flexible plastic that comes with two layers of protection and installation. The inside layer is thin with a clear material while the outside material is made up of a thick and tainted layer. This type of skylight is commonly observed in large buildings, intended to enhance the light and attractive features of sculptures, murals, paintings, planters, reflecting pools, and the likes. Those are some of the most commonly used and employed skylight for both residential and non-residential buildings. Installation is best done by a certified and licensed roofing contractor. For Skylight installation services in Charlotte, NC call Carolina Storm Roofing at (704) 307-9171; for similar services in Iredell County, NC you may also contact Carolina Storm Roofing of Mooresville at (704) 709-1142. We also specialize in installing VELUX Skylights. Read more about that here: Carolina Storm and VELUX Skylights. Contact Us Today!